It was inevitable that scammers would start using Office 365 as the basis for email scams, here’s what to look out for and how to avoid any dangerous web links. The scams are similar to the fake emails that pretend to come from banks and other large companies. They try to trick you into clicking on a false web link to infect your computer or grab your login details for identity theft. The general advice is to not click any link in a message, instead check directly on the known company web site. Office 365’s annual rental system gives criminals an opportunity to trick people with messages which ‘warn’ that the subscription is about to end. Happily, most scams are stopped by email hosts. Sometimes they are stopped before even being sent. Our list managers EmailOctopus told us about the rise of Office and Office 365 scams which they had stopped before the emails were ever sent. It’s easy to be tricked. How many people know when Office 365 is due? Microsoft does send legitimate emails as Office 365 comes due. If you have auto-renewal setup (not recommended), Microsoft appears to send an email notice as a prompt to update the credit card details. If you get a ‘subscription ending’ email and you’re not sure if it’s real, do NOT click on any link in the email message. Go to your account at https://office.com login and check your subscription status at Account | Services and Subscriptions | Overview. Microsoft persists in showing the expiry date with only digits (sigh), the expiry date above could be 10th May or 5th October. If Office 365 Home/Personal is ending soon, there’s probably a warning message on the web page. Microsoft encourages people to automatically renew with a stored credit card. A reminder that we do NOT recommend auto-renewal because it’s the most expensive way to renew. Cheaper to buy Office 365 at a retail discount and ‘top-up’ your Office 365 plan manually. The monthly updates to Office are also an opportunity for scammers. Emails tell you there’s a software update with a link to get the update. Again, do NOT click on any links in the email. Office updates automatically. There’s NO need to click on a web link. If you want to make sure you’re up-to-date. 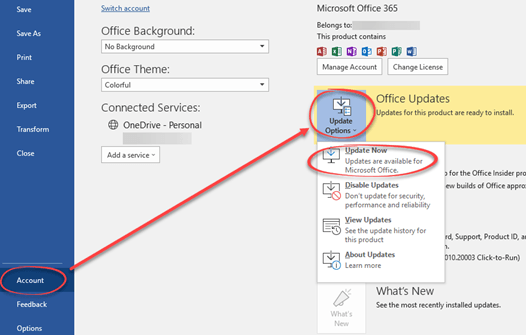 In any Office program go to File | Account | Update Options | Update Now. Any available updates are downloaded and installed.